Andrew at Camfauds Concrete Pumps recently alerted me to a story in The Construction Index about the building of a wind farm in Scotland, featuring a really good aerial shot (thanks to 360 Aerial Imagery Ltd) of the works. What was interesting to us was the two Schwing concrete pumps also in shot doing the work. Scott, our chief engineer here was able to look at the picture and straight away identify them as a Schwing S34X and a Schwing S39SX. He even knew who they belonged to. The actual story was about Hope Construction Materials having supplied the concrete for the foundations for 19 new wind turbines at Aikengall II Community Wind Farm, East of Edinburgh. The turbines, set to be commissioned in August 2016 will stand 145 metres tall and apparently be amongst the tallest in the UK and will collectivly generate 68.4 Megawatts of locally sourced energy, supplying more than 42,000 homes. 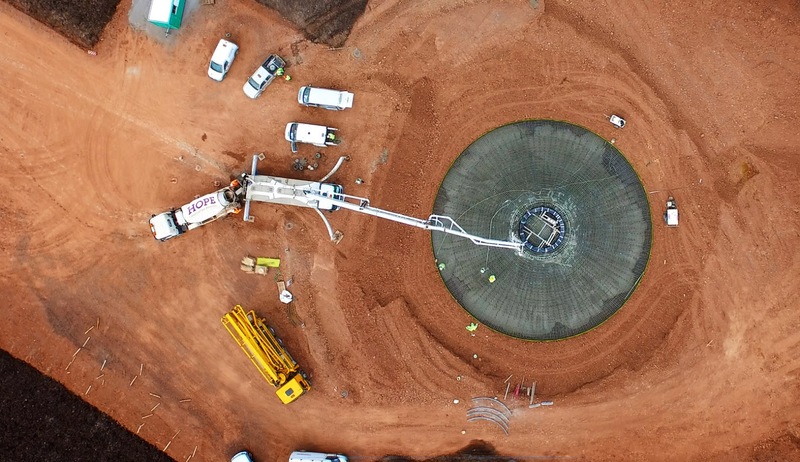 Hope provided almost 12,000 cubic metres of ready-mixed concrete from their Dunbar and Dalkieth ready mix plants for the project being built by renewable energy specialists Community Windpower Ltd. It would seem Schwing Stetter was helping out too, pumping and placing the concrete.